Beautiful five-light chandelier in opalescent Murano glass by La Murrina, every glass element bears a "La Murrina"´s mark. In some of the photos the chandelier emits a pink hue, this is due to the light bulbs used. Mid-Century Modern Lino Tagliapietra Chandelier by La Murrina in Murano glass and brass hardware, the sphere turns from black to blue tonalities when the light is on. Mid-Century Modern clear and white Murano glass chandelier by La Murrina, consisting of four lights and 12 "Lattimo" petals, every petal bears a "La Murrina"´s mark. Pair of signed clear and white Murano glass chandeliers by La Murrina, consisting of 52 petals and every one bears a "La Murrina"´s mark. A huge wall sconce made in Italy by La Murrina, Murano glasses are in perfect conditions, works 110-240 volts and need regular bulbs. 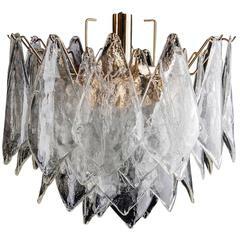 Particular chandelier by Vistosi made in Italy in the 1970s, it's in metal and opalescent Murano glass. Metal it's in original patina. Elegant chandelier compèosto 36 "Sails" made ​​of blown glass. Great-looking, either on or off. Height without chain 50 cm.